It’s no secret that I love cacti. All kinds. Tall, short, skinny, round, striped, spotted, plain. Terrariums are a great way of bringing the cacti inside and having some greenery around the place does help to spruce things up! I’d toyed with the idea of making a terrarium for quite a while and the desire only grew stronger the more I saw them on Pinterest. Then, earlier this year, I gave a friend a DIY terrarium kit for her birthday – I figured half the fun of having one is putting it together yourself so I didn’t want to take that away from her! I thought I’d document the process in case anyone else was thinking of making their own little terrarium. A glass bowl or container of some description. There’s a whole bunch of different types out there – plain round ones like the one I used, bowls with stems, some with cork stoppers, some without. I bought mine from a $2 shop and it cost $18, which is a lot cheaper than the other ones I saw. Gardening gloves to help you handle the prickly cacti. Gardening tools to help you dig the prickly cacti out of their old pots. The ones I’ve got are some nifty small ones, which are really handy for this type of activity because they help you get into some tight spots with ease. All of these items can be purchased at a gardening store – I bought my rocks, charcoal, and moss from a place called Gardenworld and I get my potting mix from Bunnings. 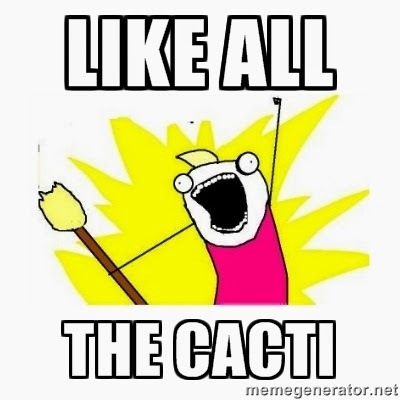 And last but not least, you’ll need cacti! Here are the ones I picked for my terrarium. I tried to pick ones with different colours, textures, and heights. You can really pick whatever you like though – there’s such a huge range available and most should be suitable for this kind of environment. Now for the actual instructions. 1. Wash and dry the glass bowl out. Wash the stones you’ve bought as well – it’s important not to introduce bacteria into the terrarium so a simple rinse will help prevent this. 2. Place a layer of stones in the bowl – just enough to cover the entire bottom of the bowl. 3. Pick out the smaller chunks of charcoal and place over the stones. 4. Place a layer of the sphagnum moss so it covers the charcoal. 5. Add the potting mix, covering the moss, but try not to add more than 3.5cm. 6. Now for the fun part – adding the cacti! Fiddle around with them before you plant them so you can figure out the arrangement you want. Once that’s sorted, you need to remove the plants from their pots. I took my mini spade and gently dug around the cactus whilst pinching the pot with my hand at the same time. This helps to loosen the soil and if you tip the plant to the side, it should wriggle out pretty easily. Once the cactus is free, gently loosen the roots to get rid of the excess soil. 7. Make a small hole in the soil in your terrarium, place the cactus in there before covering the roots over with soil and patting it down to make it secure. Repeat this process for the rest of your cacti. 8. Feel at one with Gaia and tell all your friends. This is the final product I ended up with – I’m pretty chuffed with it! I left some room around each of the cacti so they can grow and spread but I’ve seen some great terrariums that are more tightly packed. For an open terrarium like this, I’ll only need to water it once a month by spritzing it with a spray bottle. Pretty awesome, hey? For something that’s not that expensive to set up (I estimate about $50 total, with the bowl and the cacti being the most costly things) and incredibly cheap and easy to maintain, I reckon this is a lovely addition to any spot in the home that’s looking a bit dreary! That looks GORGEOUS! What a great tute!!! I love this! Pining it now so I can remember to make one!!! PS: Are you going to put any strange tiny people inside to live amongst the cacti? Good question – I did think about it and I've also seen some adorable mushrooms and daisies but actually wasn't sure where to source them. Do you (or does anyone else) know where I might find some? What a great tut. My son would love this in his room. Thanks Zena! They're such lovely things to have around you – I highly recommend making one! Aha! I found the tute. This is GREAT! I think I have to treat myself to one of these. Your tiny garden spades are so cute! Can I ask what the purpose of the charcoal is? Whoo! I've converted someone else to the Way of Terrariums. As far as I know, the charcoal is good for removing toxins and smells because it absorbs a lot of the chemicals in the soil. I believe it is optional but you might need to take some other steps instead in order to deal with the problem of toxins and smells. I love those mini garden spades! They were my Gran's – not sure where she got them from but they're perfect for this kind of thing.